How to use sum function in MS excel and How to use auto sum in MS Excel 2016 is equally beneficial for teachers as well as students.The Sum is most widely used operation in daily mathematics and accounting. Likewise, MS Excel has an extensive SUM function. With the aid of this function one can do various type arithmetic operations regarding SUM. Post Moreover, ease and simplicity is another good thing that facilitate user to use these formulas. 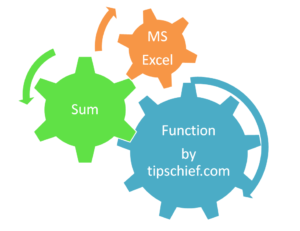 How to use sum function in MS Excel post will train you to effectively use SUM function. Methods mentioned in this document support MS Excel XP and above versions like MS Excel 2007,2010,2011,2013, 2016. As explained above SUM function is part of Math & Trig category. Either you can you use individual data value or references data values for this function. Moreover, combination of both types can also applied. Where number 1 is the first data value and number 2 is the second data value that you are going to add. In above syntax A1 represents position of data value at intersection of column A and row 1. Similarly one can use multiple selection for summing more than one data ranges. SUMIF function is also part of Math & Trig category. One can use individual data value or references data values for this function. While, combination of both types can also be used. In above syntax, range of cells is that limit upto which you want to apply criteria. Criteria is used to determine which cells you want to add and sum range tells you to sum together. Sometime need arises to use multiple criteria rather using single criteria, in such cases you can use SUMIFS function which is also part of Math & Trig category. Similar to SUMIF individual data value as well as references data values for this function can be employed. While, combination of both types can also be used. 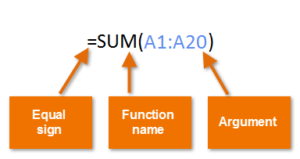 SUMPRODUCT function multiplies corresponding values in (Arrays) rows or columns and it returns the sum of their respective product of rows or columns as given in the formula selection or range. • Array1: The collection of first rows and columns which you want to multiply. • Array2: The collection of second rows and columns which you want to multiply. The above formula will calculate the product of A4 to B8 data and will sum up to the product of data D5 to E9. It gives us sum of the squares of the data values or arguments. In above syntax number 1 and number 2 are two arguments, the formula will calculate the square of both arguments and then it will sum to give result. Its result will be the sum of the difference of squares of corresponding values in two given arrays. Instead of taking the time to click the Sum button on the Home tab, it’s often faster and easier to simply press Alt+= (equal sign) to insert the SUM function in the current cell and have Excel select the range of cells most likely to be totaled. =AVERAGEIFS(data_range, criteria_range1, criteria1[,criteria_ range2, criteria2…]). AVERAGEIF, and COUNTIF functions to allow for multiple criteria. If you want to find the sum of all orders of at least $100,000 placed by companies in Washington, you can create the formula =SUMIFS(D2:D5, C2:C5, “=WA”, D2:D5, “>=100000”). Both SUMIF and SUMIFS formulae support wildcard characters. You can use wildcard characters (like: ‘*’ and ‘?’) in the ‘criteria’ argument. Moreover, In SUMIF the cells in ‘range’ argument and ‘sum range’ need not be of same shape and size. But this does not stands true in case of SUMIFS. You can use multiple operators (like: “=”, “>”, “<”, “>=”, “<=”, “<>”) in the ‘criteria’ argument of both the functions. To sum a column of numbers, select the cell immediately below the last number in the column. To sum a row of numbers, select the cell immediately to the right. AutoSum is in two locations: Home > AutoSum, and Formulas > AutoSum. Once, you create a formula, you can copy it to other cells instead of typing it over and over. For example, if you copy the formula in cell B7 to cell C7, the formula in C7 automatically adjusts to the new location, and calculates the numbers in C3:C6. Moreover, You can also use AutoSum on more than one cell at a time. For example, you could highlight both cell B7 and C7, click AutoSum, and total both columns at the same time. Inumber1, [inumber2], … Inumber1 is required, subsequent numbers are not. 1 to 255 complex numbers to add. First, copy the example data in the following table, and paste it in cell A1 of a new Excel worksheet. In the second phase for formulas to show results, select them, press F2, and then press Enter. If you need to, you can adjust the column widths to see all the data. This article describes the formula syntax and usage of the SERIESSUM function in Microsoft Excel. Many functions can be approximated by a power series expansion. X Required. The input value to the power series. N Required. The initial power to which you want to raise x.
M Required. The step by which to increase n for each term in the series. Coefficients Required. A set of coefficients by which each successive power of x is multiplied. The number of values in coefficients determines the number of terms in the power series. For example, if there are three values in coefficients, then there will be three terms in the power series. If any argument is nonnumeric, SERIESSUM returns the #VALUE! error value. At first, Copy the example data in the following table, and paste it in cell A1 of a new Excel worksheet. For formulas to show results, select them, press F2, and then press Enter. If you need to, you can adjust the column widths to see all the data. This article describes the formula syntax and usage of the SUMPRODUCT function in Microsoft Excel. Multiplies corresponding components in the given arrays, and returns the sum of those products. Array1 Required. The first array argument whose components you want to multiply and then add. Array2, array3,… Optional. Array arguments 2 to 255 whose components you want to multiply and then add. The array arguments must have the same dimensions. If they do not, SUMPRODUCT returns the #VALUE! error value. SUMPRODUCT treats array entries that are not numeric as if they were zeros. Number1, number2, … Number1 is required, subsequent numbers are optional. 1 to 255 arguments for which you want the sum of the squares. You can also use a single array or a reference to an array instead of arguments separated by commas. Moreover, numbers, logical values, and text representations of numbers that you type directly into the list of arguments are counted. On the other hand, If an argument is an array or reference, only numbers in that array or reference are counted. Empty cells, logical values, text, or error values in the array or reference are ignored. At first, copy the example data in the following table, and paste it in cell A1 of a new Excel worksheet. Secondly, For formulas to show results, select them, press F2, and then press Enter. If you need to, you can adjust the column widths to see all the data. we hope you enjoy-How to use sum function in MS excel | How to use auto sum in MS Excel 2016- please comments and subscribe our channel.